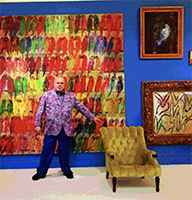 Bringing a whimsical, freewheeling sense of awe, wonder and detail to his wild array of paintings and sculptures and peaceful, mystical living and working spaces, NYC based artist and lifestyle trendsetter Hunt Slonem is considered one of the great colorists of his time. As vibrant a dresser (favoring bright jackets and ties) and decorator (known for his keen eye for refurbishing homes and pairing vintage furniture with contemporary art) as he is a painter and sculptor, the Maine born creative force of nature is well known for his neo-expressionist works of butterflies, rabbits and tropical birds, the latter often inspired by the 30 to 100 exotic feathered friends he houses at any given time in an aviary in his 30,000 square foot Manhattan studio. Slonem has had over 300 one-man shows in galleries and museums internationally. His work is also in the permanent collections of 250 museums including the Guggenheim, the Metropolitan Museum of Art, the Whitney, and the Moreau Foundation. He currently has a licensing deal for a new line of Lee Jofa wallpaper and rugs and an upcoming collaboration of scarves and totes with New York based Echo design. Slonem is currently releasing When Art Meets Design, an extraordinary 300 page, (280 illustrations) photography based volume that offers a dynamic view into his fantastically decorated and meticulously restored homes. These include three historic houses that he rescued and refurbished, including the Cordts Mansion in Upstate New York and his two Southern mansions in Louisiana, Albania and Lakeside.